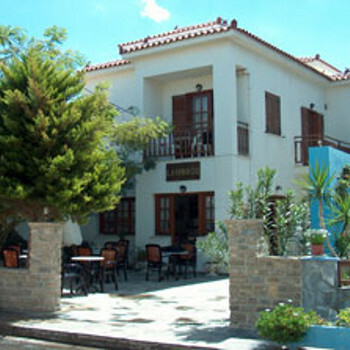 The Lambros Hotel is a friendly, family-run complex situated beside the sea. This pleasant, central location is a great base from which to relax and explore. Hotel Lambros is run incredibly well by Sophia, and nothing is too much trouble. The Hotel is small friendly and kept incredibly clean by the maid. Fresh towels and sheets every day and rooms cleaned six days a week. The Lambros is situated in a perfect position, right in the centre of the village within easy reach of all shops and directly over the road from the long pebble beach. Cannot recommend the Hotel Lambros and its little swimming pool enough, although we would recommend that on your special request section, you ask for a high floor, as the ground floor studios/apartments are not particularly private as everyone has to walk by your terrace to get to the hotel entrance upstairs and to block B of the hotel. The breakfast is continental style, featuring a selection of honey, jams, cheeses, hams, bread, orange juice, tea or coffee, and Sophia supplements this with cereal every day, and on some days boiled eggs, other days sausages. Sophia and her husband keep the Hotel in immaculate condition and cannot do enough for you, should you ask.